So many people commented on my makeup that I wore to the Burberry show that I thought I’d knock together a quick recreation of it on video. It isn’t exact, I’m afraid, but that’s partly because I didn’t have the foggiest recollection of how I’d done it all in the first place. I often apply my makeup whilst half asleep, munching on toast between brush strokes and using one arm to restrain the cat as he tries to eat the contents of my makeup bag. So it’s a “rough”, as we used to say at school. It’s only the Rough, Miss! I’ll do joined up handwriting for Best! 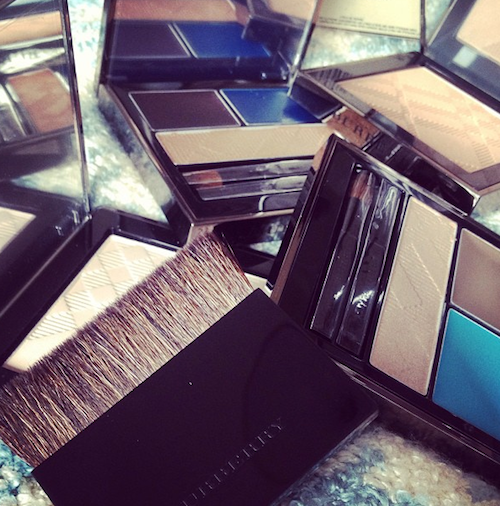 I am quite taken with the two Burberry products used here – the Splash palette and the Fresh Glow powder. Both are so gorgeously made – it makes application a dream. I have to give due credit to the tools, though – the Real Techniques Duo Fiber brush is excellent for light-handed powder application and whatever that eye brush was (your guess is as good as mine – Becca, perhaps?) is a great fluffy shadow tool. Let me know what you think! It has been ages since I used the Becca Skin Perfector – I stopped showing it in videos for a while because it was never in stock and I thought that it would be mildly frustrating for people, but now Space NK seem to have a steady supply. See links below for stockists and more info on each product. If you’re reading on email then please click here to watch the video.